We are actively engaged in designing and manufacturing Sewage Treatment Plant that is required for sewage water cleaning application. The different types of Sewage Treatment Plants that we offer are available in numerous configurations and sizes. In the making of Sewage Treatment Plants, we utilize the finest grade parts & components. In addition, the Sewage Treatment Plants are made by using the latest techniques at our highly advanced manufacturing set up. 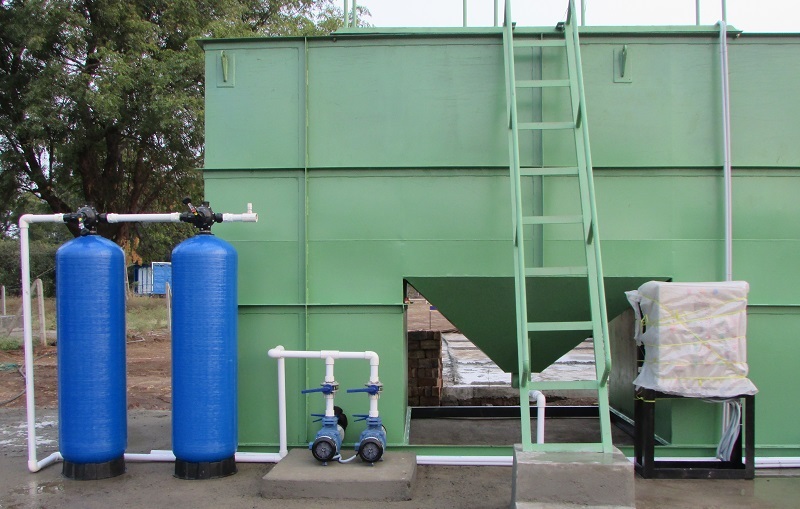 Furthermore, we are counted as the most reliable Sewage Treatment Plant Manufacturer and Supplier in Tamil Nadu. The sewage shall be passed through the screen chamber to remove big and floating particles from the sewage. Bar screen shall be provided in the screen chamber. The screened sewage shall be collected in the collection tank/equalization tank. From there it shall be pumped to the FLUIDIZED BED BIOREACTOR where diffused aeration mechanism with floating media immunized with microorganisms shall be provided for efficient BOD reduction. The overflow from FBBR Tank shall be settled in the secondary clarifier. A part of the sludge shall be re-circulated to the aeration tank to maintain MLSS. The wasted sludge shall be pumped to the sludge filtered to filter press for dewatering and the dried sludge shall be disposed. The filtrate from the filter press water shall be let into the collection tank. The overflow from the secondary clarifier shall be collected in the clarified water tank. Then from there it shall be pumped to the pressure sand filter and activated carbon filter. The treated water shall be passed through hypo dosing disinfection system and it shall be reused for flushing or gardening. Conventional activated sludge systems commonly include an aeration tank and secondary clarifier. Aerobic biomass reduces the biochemical oxygen demand (BOD) and ammonia concentrations in the aeration tank. Biomass then flows to the secondary clarifier, where it is separated into clarified water and thickened biomass by gravity sedimentation. The clarified treated water overflows at the top of the secondary clarifier, and the thickened biomass is recycled to the aeration tank or managed at sludge dewatering facilities.